KIEV, Ukraine -- Over 3,000 businessmen from various regions of Ukraine gathered on Maidan Nezalezhnosti (Independence Square) in central Kiev on Monday morning to protest against the new tax code approved by the Verkhovna Rada on November 18. Trade union representatives are holding a rally near the Independence Monument under Ukrainian flags and trade union symbols, including that of the Federation of Small and Medium Business Trade Unions. They also carry placards, which read, "Say No to the Code", and, "You Took It All, Leave Us Our Jobs", as well as, "Hands Off Our Money", and so on. 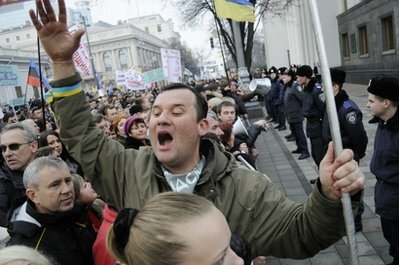 The protest keeps growing, and the protesters say they want to picket the building of the presidential administration. It is planned to march toward Bankova Street, where the presidential administration is located, and to demand that the Ukrainian president veto the new tax code. The businessmen will also demand the resignation of the tax code's authors, including Prime Minister Mykola Azarov, Head of the State Committee for Regulatory Policy and Entrepreneurship Mykhailo Brodsky and Deputy Prime Minister Sergiy Tigipko. The protesters said that Kiev police had barred 140 buses carrying businessmen from other regions. There is no confirmation from the traffic police. The city police said that a sufficient number of officers had been assigned to ensure law and order during the protest. The protest is peaceful.